Richard Reich explains the class warfare waged by the oligarchs against the rest of us (the specifics are US-centric, but the principles are universally applicable). to position Scotland as a force for good in the world through soft power, cultural exchange and peaceful co-existence. A Yes vote will allow Scotland to flourish according to its own values, aspirations and vision, and it is essential that Scotland’s political culture is fully aligned with its values, aspirations and vision, and that will be the best possible foundation for Scotland to fully play its part in the world. A Yes vote will allow Scotland to address its own distinctive needs, and to adopt policies suited to addressing those needs across all areas of governance affecting Scotland. Addressing those needs is a necessary pre-condition for Scotland to flourish, and to realise its great potential. By nurturing self-respect, democratic empowerment, and health and well-being at home in Scotland, Scots can then contribute to being the change that many of us want to see in the world, though our own example. A Yes vote is a necessary first step to facilitate such opportunities, change, transformation and deep healing. The time for YES is NOW! (Words from Neill Walker, South Queensferry. I couldn’t say it better myself). I’m currently running UK v1.0. It doesn’t work very well. It’s corrupted and glitchy, and the CityBankster trojan seems to have hijacked the system. It keeps on doing things I don’t want it to, like opening a Trident upgrade and pouring all its system resources into that. I cannot fix the persistent inequality bug or the social exclusion bug. The user interface, ‘Low quality democracy’ is difficult to use and doesn’t give me much control over how the system operates. I called a troubleshooter called LibDemPromises, and they said they’d fix it, but they’ve done nothing – if anything, it’s worse. I’m at my wits end. I’m planning to upgrade to an iScotland running the new Model Constitution OS (or something very like it). Organisations like the Reid Foundation and Compass are doing great, necessary, ground-breaking, debate-changing work, updating the principles of social democracy for the 21st century and setting out a policy agenda for a better Scotland. 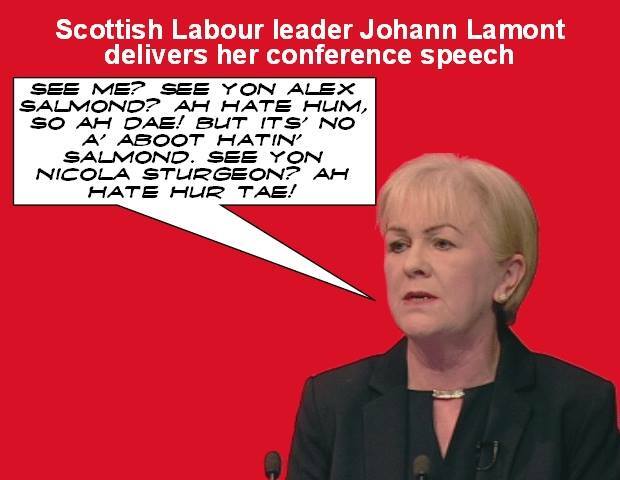 ‘Labour for Indy‘ are trying to imagine how labour values and principles (remember them, folks?) could contribute to Scotland’s post-independence democratic landscape. Meanwhile, the Scottish Labour Party is nothing but a corrupt coterie of self-serving, intellectually stunted, morally bankrupt hacks, who contribute nothing and achieve nothing, with no vision, no purpose, and no hope. I don’t always try to correct people who are wrong on the internet, but when people are wrong about Scottish independence, I will try to convince them with as much intellectual force and passion as I can muster. I will do so because the fate of millions of people, for generations to come, is at stake. The health education, prosperity, well-being and life-chances of many millions depend on freedom and good government; and freedom and good government depend on a Yes vote in 2014. If people run away from this opportunity we have, if they flinch or falter, then we are consigning ourselves not to ‘the status quo forever’ (which might seem like a tame, safe option), but rather to the abandonment of our sovereignty, the erosion of our hard-won democratic powers, and the continuation of London-rule and of the oligarchic hegemony of the Westminster political establishment. That means things will get worse for all but a tiny slice of the rich at the top of the pie. We have one shot at a new start and a change of trajectory. We have one way of setting our sights on something better than the dystopia of life in the dried up husk of a rotting empire. That way is by voting Yes in September 2014. We cannot afford not to take it. This referendum is ultimately a choice not between Scottish and British identities, but between two political and constitutional futures. A vote for Yes is a vote to become a citizen, to be a member of a self-governing community which aims at the common good, to be part of building a better society for all of us. A vote for No is a vote for subjecthood, for remaining part of an corrupt, oligarchic, selfish, duplicitous and immoral empire-state that serves the private and particular interests of a privileged few. My plea to fellow Scottish voters is this: Don’t be a nay-sayer. Don’t collude in subjection. Have faith, have courage, have hope. We can build a better country. It all starts with YES. If you are unsure, read the White Paper ‘Scotland’s Future’. Contact the Yes campaign – ask them hard questions. Don’t let ignorance or fear cause you to make a decision that future generations will regret.